An ACLU report describes overcrowding, squalid conditions, insufficient medical care and overuse of isolation units at federal Texas prisons where convicted immigrants await extradition to their homelands. Editor's note: This story has been updated throughout to include responses from the private prison operators and the federal Bureau of Prisons. Thousands of non-citizens are subjected to abusive and dangerous conditions in privately run federal prisons in Texas, according to a report by the American Civil Liberties Union released Tuesday. The report, which comes after a five-year investigation that began in 2009, describes pervasive overcrowding, squalid conditions, insufficient medical care and overuse of isolation units at Texas’ Criminal Alien Requirement prisons, which house people convicted of federal offenses who are scheduled to be deported after completing their sentences. The federal Bureau of Prisons contracts with three corporations — Corrections Corporation of America, GEO Group and Management and Training Corporation — to manage 13 criminal alien prisons across the country with about 25,000 inmates. More than half of them are housed in five Texas facilities, located in Big Spring, Post, Eden, Pecos and Raymondville. In an email, a representative of GEO Group, which runs the prisons in Big Spring and Pecos, wrote, “GEO’s facilities provide high quality services in safe, secure, and humane environments, and our company strongly refutes allegations to the contrary.” Officials from the Management and Training Corporation, which operates the facilities in Post and Raymondville, said in an email, “We patently refute the ACLU’s allegations that inmates are abused and mistreated.” Officials from the Corrections Corporation of America did not immediately respond to requests for comment. Prisons bureau spokesman Chris Burke said in an email, "There is no overcrowding in the BOP's privately-operated secure adult correctional facilities." He said that the use of private facilities for criminal aliens frees up resources for U.S. citizens housed in government-run federal prisons. Based on interviews with hundreds of inmates and thousands of legal documents, the ACLU reported that the criminal alien units are part of a “shadow” system in which inmates — nearly all of whom in 2010 had been convicted of only nonviolent crimes, including drug charges and illegal entry or re-entry to the United States — are subjected to worse conditions than those in government-run federal prisons. At Willacy County Correctional Center in Raymondville, for example, almost 3,000 men live in 200-foot Kevlar tents that each house 200 men. Inmates described filthy, insect-infested facilities and putrid smells from constantly overflowing toilets. The report also tells the of stories of inmates who were denied medical treatment for serious conditions. One prisoner described watching his cellmate deteriorate for hours while prison security officers ignored his pleas for medical help. By the time it arrived, the man was unconscious; he died a few hours later. Some of the report’s sharpest criticism was directed at the widespread use of segregated housing units, or isolation cells, a practice the ACLU called “pointlessly cruel.” Prisoners described being placed in isolation for months as punishment for minor offenses or for complaining about conditions. 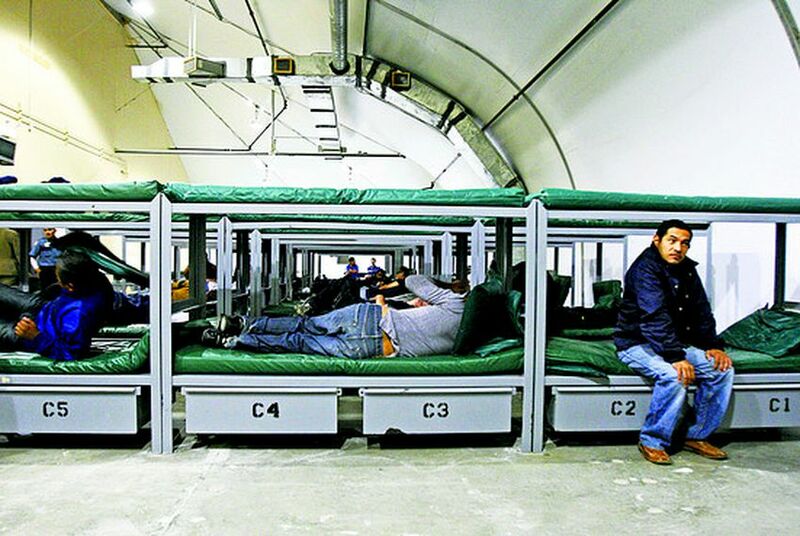 At some of the units, new arrivals are routinely placed in isolation for weeks until general population beds open up, the ACLU reported. The conditions result from lax oversight and from prison bureau policy, according to the report. Privately run prisons are only obligated to follow a portion of prison bureau regulations, which the ACLU said leads to inconsistencies. Because the private prisons must cover the cost of inmates' medical treatment, they have an incentive to provide as little as possible, the ACLU argued. The government contracts, meanwhile, provide per-inmate compensation to the operators, and the companies receive that rate for up to 115 percent of capacity. That arrangement, the ACLU said, incentivizes overcrowding. All five Texas facilities operate at or near the 115 percent threshold, said Carl Takei, a staff attorney at the ACLU National Prison Project who worked on the report. Burke, the prisons bureau spokesman, disputed the ACLU’s conclusion that the prisons are overcrowded, arguing that the 115 percent figure represents their actual capacity. The prison contracts also require 10 percent of beds at each facility to be reserved for isolation. “We’re talking about segregating a group of people on the basis of their immigration status in a facility that is by all measures second class to the hard-core BOP prisons that we see felons incarcerated in,” said Rebecca Robertson, legal and policy director at the Texas ACLU.